We are proud to offer this gorgeous wine glass drying rack and bottle stand. Holds 6 of your favorite wine glasses for display and drying. One bottle of your cherished wine sits in the middle for convenient storage. Assembly is quick and straightforward with all the hardware included for easy set up. Made of high quality bamboo this wine rack is built to last and look great in your kitchen. 10 x 10 x 9 inches. SUPERB QUALITY: Made of the finest bamboo in an environmentally friendly process, this wine rack and bottle stand is very durable for any countertop. FUNCTIONALITY: Drying and storing your wine glasses is effortless. 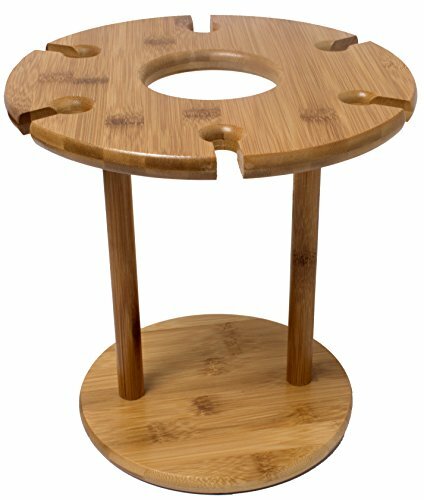 6 slots designed into the bamboo rack make placing and removing your wine glass fast. One large diameter hole in the middle of the wine rack is perfect for storing a bottle of wine. QUICK ASSEMBLY: All hardware is included for swift assembly of the wine rack. Have your new wine rack and bottle stand set up and ready for use in minutes. OVERALL DIMENSIONS: 10 x 10 x 9 inches. An ideal wine glass drying rack and bottle holder for your kitchen counter, cabinet or tabletop. If you have any questions about this product by Royal Brands, contact us by completing and submitting the form below. If you are looking for a specif part number, please include it with your message.